Welcome to the apex of wildlife adventure. Nestled into Great Bear Rainforest and surrounded by pristine waterfalls, 10,000-year-old glaciers and snow-capped mountains that soar through the clouds, Nimmo Bay is a natural paradise. Stay in a chalet perched on the Pacific and choose from an array of adventure options so wide, you might need to stay a month to squeeze them all in. Fortunately for you, we’re friends with the owners – and the Murrays would love to show you around. Nimmo Bay is the perfect place for nature lovers who want to explore the vastness of British Columbia’s bounty and revel in comfort and style at day’s end. 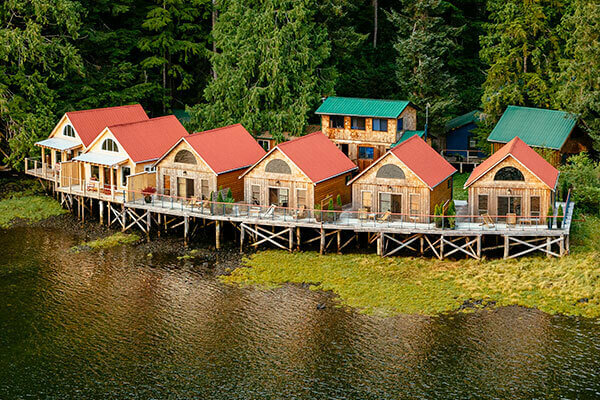 Note that six of the cabins are on the water, while three are set back into the forest. Most Memorable Moment? It's a tie between kayaking with dolphins and getting up close and personal with orcas! Everything about the experience at Nimmo Bay is breathtaking: the seclusion of the resort, the serenity of the Great Bear rain forest and the stunning views from the private helicopter. Nimmo Bay Resort is accessible only by air or water. The resort itself is the only development in the area and does not have any road access – it is a truly remote experience, and getting there is part of the adventure! Please contact us to arrange travel via Vancouver International Airport (YVR), private jet, float plane or other options. Whether you want to take to the skies and explore your surroundings via Nimmo’s suite of helicopter adventures, or traverse the terrain (and the waters) in and around the resort, Nimmo offers myriad ways to immerse yourself in its abundant beauty. 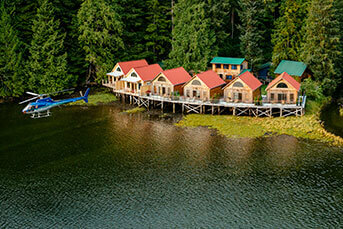 Nimmo Bay offers nine spacious-yet-cozy cabins: six intertidal cabins and three forest cabins. All nine are solid wood cabins carefully constructed with the surrounding environment and guests’ comfort in mind. The intertidal cabins have red-peaked roofs and allow you to experience the rise and fall of the tide right beneath you. These four-room units have a comfortable living area, a washroom and two bedrooms; one with a king-sized bed and one with either a king or queen-sized bed. Fall asleep to the sound of the nearby stream and cascading waterfall in the green-peaked forest cabins. These four-room units have a comfortable living area, a washroom and two bedrooms, each with a queen-sized bed. 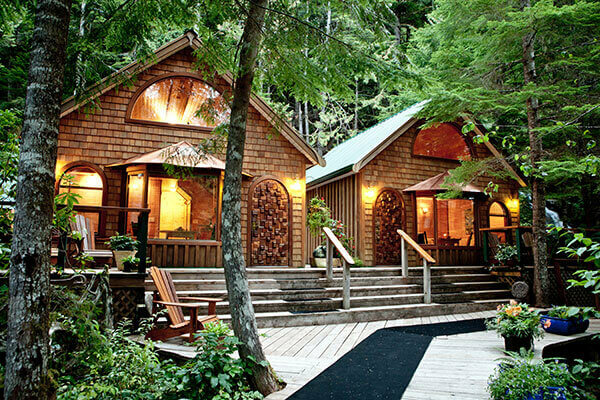 Situated in a UNESCO-protected biosphere, Clayoquot Wilderness Resort is a Relais & Chateaux eco-safari outpost boasting 25 luxury tents arranged along the ocean’s edge. Brush Creek Ranch boasts a collection of historic guest ranches nestled between the Sierra Madre Mountain range and stunning Medicine Bow National Forest on a 30,000-acre working cattle ranch. Looking to extend your adventure? Discover a few of our favourite ways to journey through British Columbia’s bounty.